Do you write the same old, boring resume that everyone else does? Change it up, put a logo on your resume, give the employer's eyes something to see other than an endless mountain of words. Use a logo that you created or pick one of ours, having something different than what everyone else has makes you more conspicuous. And that's the whole point isn't it? To be the leader, to be the one who gets hired? Begin researching different methods you can use to be disparate from all the other applicants. We have many resources on-site, make use of them to discover the many ways to improve your writing and preparedness for the job market. What kind of logo do you need for this? Anything you like! It can be your photograph, a cool looking image that you created yourself or found somewhere and got permission to use, a picture of something you built, whatever you think would be appropriate. Try to choose an image that will add value to your resume. The value could be added from displaying one of your creative works or a formal design like one of our monograms. It is up to you as you are the best person to know what your goals are and the direction you want you career to go. Once you have your logo sorted out your next task is to begin writing. Do you know how to write a resume? We have tutorials that can help with that. We have tutorials that can help with most topics that are related to careers and the job market. Since 2011 Resume4Free has been helping our fellow job seekers generate better resumes and be better prepared for what lies ahead in the job market. 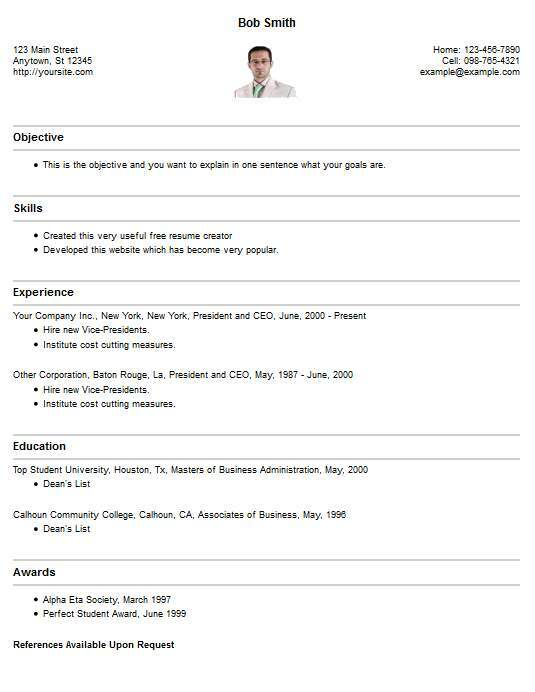 Please get this template by writing your resume here, with us, you never have to pay for it and you can use all the services we offer, many others already have.